Lovely capture, Phillip! I bought this one last year. Does it self sow? I can almost "hear" it! This is one big grass. Lovely with the back lighting. Planted this a couple of years ago, and it is a complete star in my garden! Thanks for an awesome photo! I do love that grass, Phillip; actually there are few ornamental grasses that I don't like. Wonderful photo! Beautiful Adagio and light Phillip. Great photograph! I Love this grass. It is wild and free and makes me happy to look at it. Looks so lovely. Please tell me it doesn't self-sow and I'll try it. My husband has practically banned grasses here after love grass seedlings took over the gravel driveway. I have not seen this grass self-sow. A tall grass. I think I have seen a grass like that in our farm. Nice shot. Came back to see your answer. 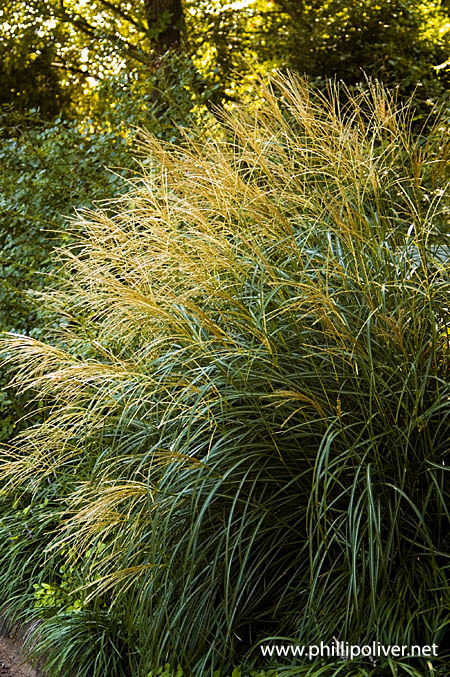 I'd love to add more grasses to my garden because they are definitely drought and deer resistant. I've been growing it for several years and have never seen it self sow. I almost wish it did; it's not easy to find here. I love miscanthus. I actually think they're quite addictive. Very graceful late summer stars. Do you know m. sinensis 'malepartus'? I saw a mature one growing at a nursery some time ago and was really taken with it. Adagio is a beauty and that's a nice shot Phillip. That's a gorgeous shot! I've been looking for adagio locally with no luck. Finally decided to put it in my basket at Bluestone for a fall order. Btw, I thought you had stopped blogging. For some reason my bookmark for your blog kept showing your December post ... Christmas aftermath, in which I fall in love with a Kindle. Today I clicked on your website button and then your blog button and voila!